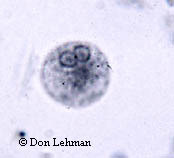 The cysts of Entamoeba histolytica, shown below, measure between 10 and 20 µm in diameter. The key identification feature is the number of nuclei; cyst will have 1 to 4 nuclei. In addition, the peripheral chromatin is generally evenly distributed. In the images below, two nuclei are clearly visible. Image on the left is iron-hematoxylin stain (1000x), and the image on the right is an iodine wet mount (1000x). 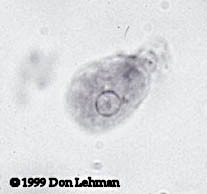 The trophozoites of E. histolytica typically have a diameter of 15 to 20 µm. They exhibit narrow pseudopods. 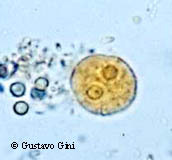 The image below left is an iron-hematoxylin stain (1000x). 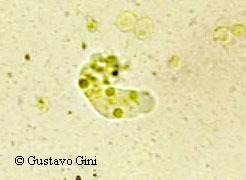 The image below right a wet mount of E. histolytica with a "finger-like" projection and ingested red blood cells (1000x).